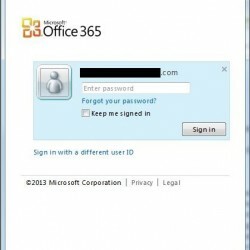 It can be tricky initially to setup Office 365 with Outlook, but it is very useful to have your email, contacts, calendar, and tasks all stored outside of Outlook Web Access. While web apps are getting better, they still aren’t up to par with a dedicated program like Outlook. These are the minimum requirements at the moment, but Windows XP and Windows Vista are only being officially supported until the end of 2013, so it highly recommended that Office 365 users upgrade to Windows 7 or 8 during the next 9 months (and if you still have a functional XP machine, you are either very lucky or take very good care of your machine). Also, before setting up Office 365, it is highly recommended that you make sure that both Windows and Office are completely up to date on your computer. This will eliminate any potential issues related to patching that may come up. 1. 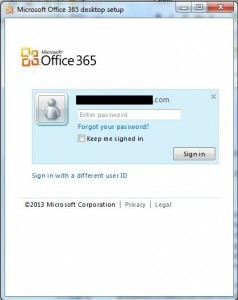 Sign into the Office 365 web portal using your Office 365 username and password. 2. On the right side of the page under “Resources” there is a link that says “download”. Click on this. 3. At the bottom of the downloads page, there is a section that says “set up and configure your office desktop apps”. Click on the “Set up” button. 4. This download a small program, which you should run. 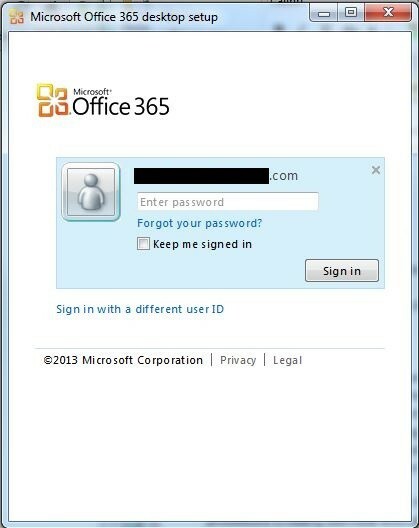 After it runs, you should end up on a screen asking for your Office 365 email address (which it may fill in automatically) and your password. Enter your password and hit the “sign in” button. 5. 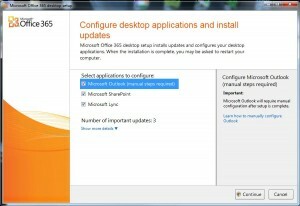 It will check your system for the appropriate updates, then let you know what needs to be installed, Even if you fully updated your system, there are often still some Office 365 specific items that need to be installed. Make sure all the boxes are checked and hit continue. The updates should run, and then will either finish, or more than likely will ask you to restart your computer. Proceed with the restart (if necessary). 6. Once restarted and logged back in, it will finish up and let you know what was successful (hopefully everything) and what wasn’t. 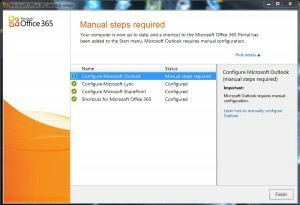 It will also inform you that manual steps are required to configure Microsoft Outlook. Click Finish. 7. 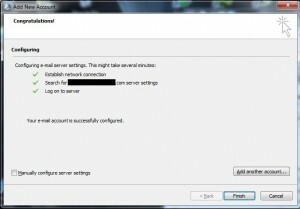 Next start up Outlook and add a new account. 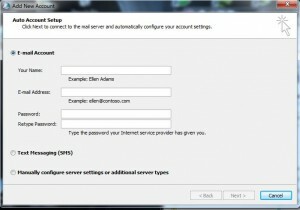 Under email account enter your name, your email address, and your password, then click “Next”. 9. From there you should be good to boot up your Outlook and use your email!